Since 2005 Western Pomeranian Nature Society has been taking care of free living herds of European Bison in West Pomerania Voivodeship. One of the herds occupies mainly the area of Miroslawiec Forestry and comprises of approximately 90 individuals, while the other one stays mostly within Drawski Military Training Field and numbers about 60 individuals. 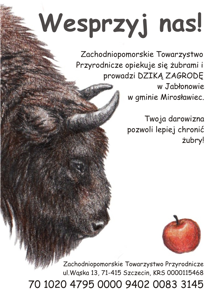 Bisons came to Miroslawiec Forestry thanks to Professor Ryszard Graczyk, the director of the faculty of zoology at the Agriculture University in Poznan at that time. In 1980 8 individuals from the Bialowieski Forest were brought to acclimatization enclosure in Walcz Forestry, from where they eventually moved to current home range. Drawsko herd was created in 2008. First, two acclimatization enclosures in Dobrzany and Łobez were settled with 8 bisons each. After leaving the enclosures they united into one herd in which they live together until today.